School psychologists partner with families, teachers, school administrators, and other professionals to create safe, healthy, and supportive learning environments that strengthen connections among home, school, and the community. The School Psychology program encompasses two years of full-time study and one year of internship. Students proceed with their cohort through a carefully selected sequence of courses, which provide knowledge of diverse approaches to direct and indirect interventions (such as assessment, counseling, behavior management, academic interventions, and consultation). 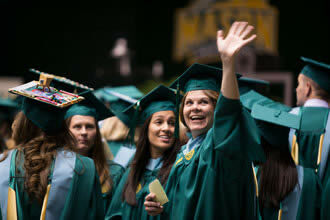 In addition to providing students with expertise in evaluation and intervention techniques for exceptional children, the GMU program also emphasizes methods to improve the educational outcomes for all school children including school-wide prevention methods, pre-referral intervention, and consultative and counseling roles. Given the diversity of children and families in northern Virginia, multicultural knowledge and sensitivity and is emphasized throughout the program. Note" Students who are eligible to waive coursework must complete a minimum of 15 credits in residency to graducate. In the third year of the program, students complete a 1200-hour internship in a school district. These positions are advertised by schools and in the metropolitan DC area, they are generally paid. Interns go through an interview process, and once hired, they are considered employees of the school. While many of our students elect to remain in the Maryland/Virginia schools, our students are eligible and prepared for internships across the country. Our students have sought and obtained internships nationally. Students receive supervision from their field-based intern supervisor as well as from university faculty. Upon successful completion of internship and graduation from the program, students take the national exam in school psychology. This leads to licensure by the State Board of Education as a school psychologist. Students are also eligible for National Certification in School Psychology (NCSP), which is an additional certificate that is well respected in the field. Because the GMU program is a NASP approved program, the application process for the NCSP is streamlined. Complete and detailed requirements for the Mason School Psychology Training Program internship appear in a separate document entitled The School Psychology Internship: A Handbook of Guidelines.